for those of you that frequent smbp you know i love to layer flavors and textures. oh local organic greens how i've missed you. 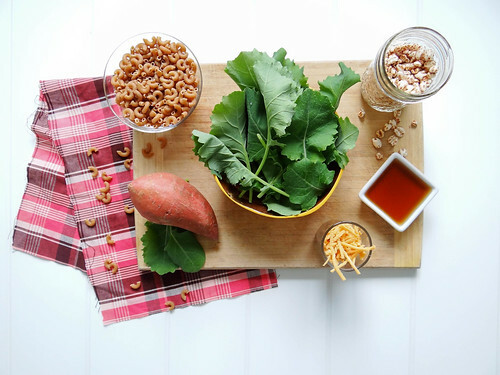 so Siberian kale was a shoo in , then the thought of maple syrup (local of course) randomly popped into my head - sweet potatoes love maple syrup, Justin wouldn't be eating this so why not be adventurous. 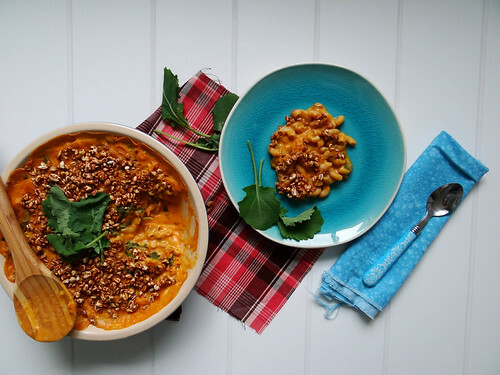 during breakfast i was catching up on my everyday food magazine from Martha, in it was a gluten free recipe for mac n' cheese that featured puffed rice as the crunchy topping - i had to try it. i wasn't sure how it was going to turn out - let me tell you, never doubt Martha. it was amazing! the sweet potatoes are steamed then pureed with almond milk using an immersion blender. 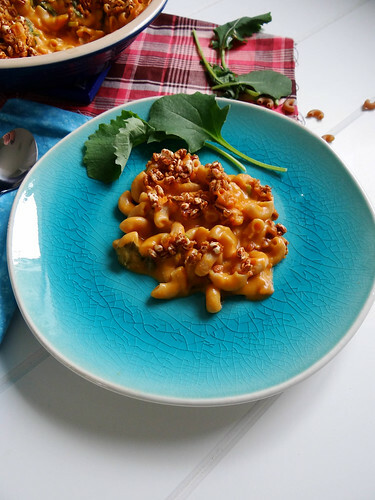 daiya cheddar shreds, maple syrup, baby Siberian kale, salt, white pepper and cooked elbow noodles are added to the sweet potato puree and mixed all together. the rice puffs are slightly crushed/chopped and stirred with melted butter, then sprinkled over the top. the verdict - omg, one of the best mac n' cheezes i have ever made. the flavors where incredible, i absolutely loved the maple syrup and kale paired with the sweet potatoes. 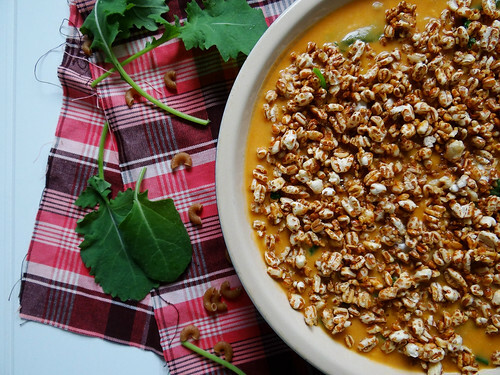 not only perfect for Sundays but also perfect for potluck's, dinner with friends and bbq's. in a medium sauce pan puree steamed sweet potato & almond milk until smooth. over medium heat add maple syrup, daiya cheddar shreds, kale, white pepper & salt, stir until daiya has melted. add cooked & drained noodles & stir. 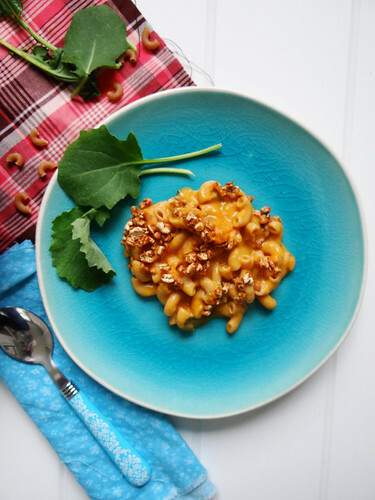 transfer mac n' cheeze to a baking dish of your choice. leftovers store well in the fridge or freezer. I am just not a creative cook like this. I get about as far as stir frying my assorted vegetables and trying to decide between couscous and quinoa. 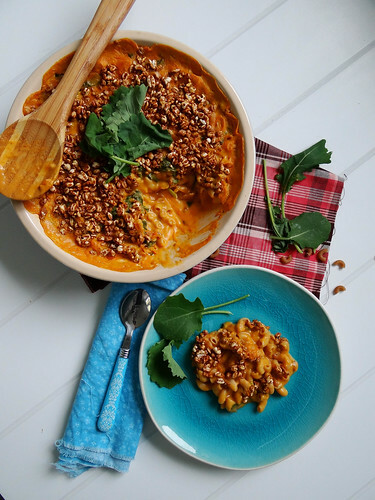 I love sweet potatoes, kale, and mac so this combination has to be dreamy! I just finished the last of it for lunch today - even better the following day! Rainy days..tea, cats and books are always great. I just need to add your recipes to my next rainy day.. It looks delicious!! Aren't they, I love a rainy day once in a while - all that's missing is the fireplace in my house, when I have that I will be in heaven! Oh, man! I miss rainy days. It hardly every rains in Denver (300+ days of completely clear skies and sunshine a year) - but this Thurs/Fri we're supposed to get some storms.. and I am so. freaking. excited. 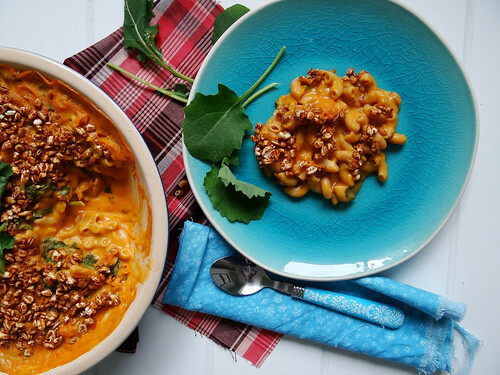 I might just have to make this mac'n cheese, because I've never even attempted such a recipe since going vegan and gluten free. 300 + days of sunshine, I think I found where I am moving when I head out west someday to find my Dream House and Barn Studio! Oooh, my tummy is rumbling! The Boyfriend would never touch this, though. I'll have to sneak this in the next time I'm alone, haha! OMG. I'm drooling. I'm very seriously drooling all over my keyboard. 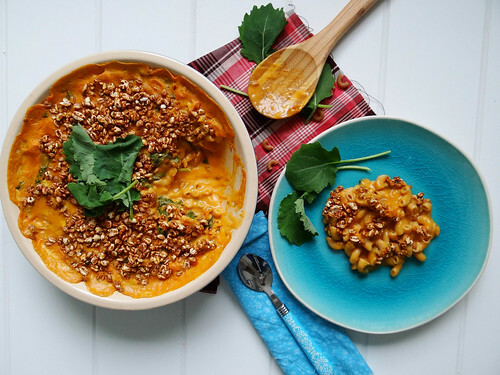 sweet potato mac and cheese with KALE?! this..is amazing, girl. and i think it is ridiculously awesome/adorable that the topping includes rice puffs! 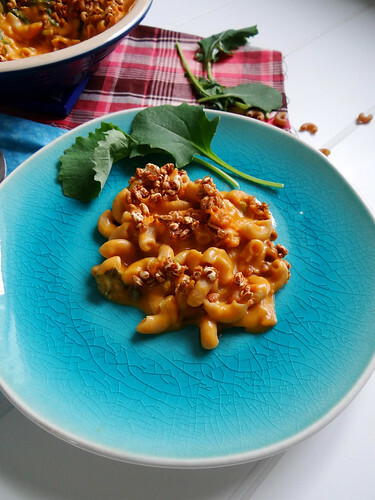 that is one gorgeous mac and cheeze.. i love those rice puffs on top. 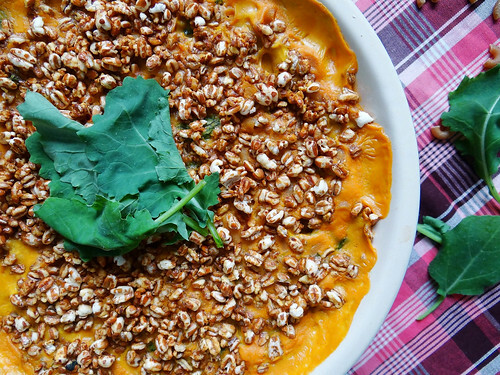 I need to get some sweet potatoes this weekend and make some of this creamy gorgeous deliciousness! it rains pretty much all weekends here.. so i cant use that as an excuse.. i can definitely make this an early friday night movie side! It was so creamy without cream or a pound of cheeze - so much better for you! This would definitely be a perfect side fo Movie night - pizza and beer is typically our movie night treat, but I would definitely be happy with this once in awhile! I love the idea of using rice puffs as a crunchy topping! I'm drooling just thinking about this. It's been rainy here too and I'm craving some serious comfort food! Isn't it funny how cold rainy weather does that to you - I instantly want to cuddle up with some warm slw baked food a cup of tea and a book - love days like that once in a while! The rice puffs seem interesting to me, but it's things like "vegan butter" and "daiya cheddar shards" that pique my curiousity. I'll look for them the next time I'm at Whole Foods. That looks like a killer mac n cheese! I've never seen anything like it but I would sure love some! Super! Can you suggest anything to substitute for the Siberian kale if I have all the ingredients and I just want to make it now? Baby Spinach, Swiss Chard or Arugula would all be excellent substitutes! I am officially no longer mad at Martha Stewart. Now I'm just mad that I have everything but the sweet potatoes. I do, however, have some butternut squash. Thanks for making me glad instead of mad. Sometime do what my mom did, make us shut our eyes and open our mouths which come to think of it could be a freaky experience although usually rewarding as well. Last night I made roasted kale with sweet potato fries but didn't think of pairing them with mac 'n cheez. freakin genius. Martha and I have had some fisticuffs over at my blog. Sweet potato is an excellent party guest! Sounds absolutely delicious! I love kale! I just recently started loving kale...it alll began with adding it to my morning juices, I can't seem to get enough of it! Mmm I like your idea of comfort food - this week has been so gloomy so something like this would be perfect! 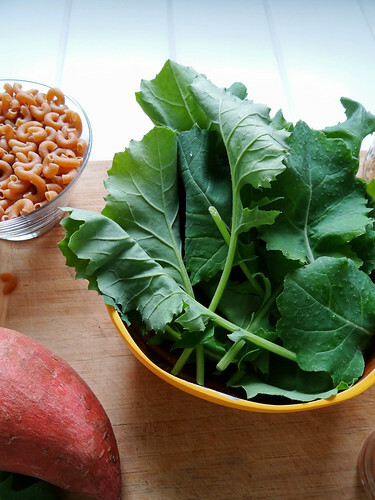 I love the combination of sweet potatoes and kale, and I never would have thought to top it with rice puffs either! And I see you gave me another idea for a way to use my white pepper! This makes me so happy to read! I bet the black kale was amazing, I am glad to know that the recipe doubled well and vegans & nin- vegans alike enjoyed it! Well then, this is definitely your Mac n' Cheese! 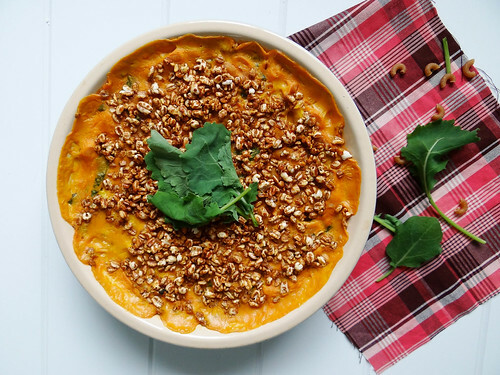 Any day is a great day for sweet potatoes, they are so amazing! My love for sweet potato and guilt whenever I eat regular baked macaroni and cheese make this a definite bookmark! Just found your blog (I moved to Keene from Boston for work 6 months ago and was hunting around today for some more NH-based New England blogs to follow) - so glad I did! Beautiful. Your job sounds amazing, what a great opportunity to work with Yankee Magazine!